Just outside of the town of Tudela, in Navarra, perched on the edge of the deserts and canyons of the Bardenas Reales, sits one of Spain’s most unique hotels. Aire de Bardenas is not just a hotel—it’s more of a complex of lodging curiosities. 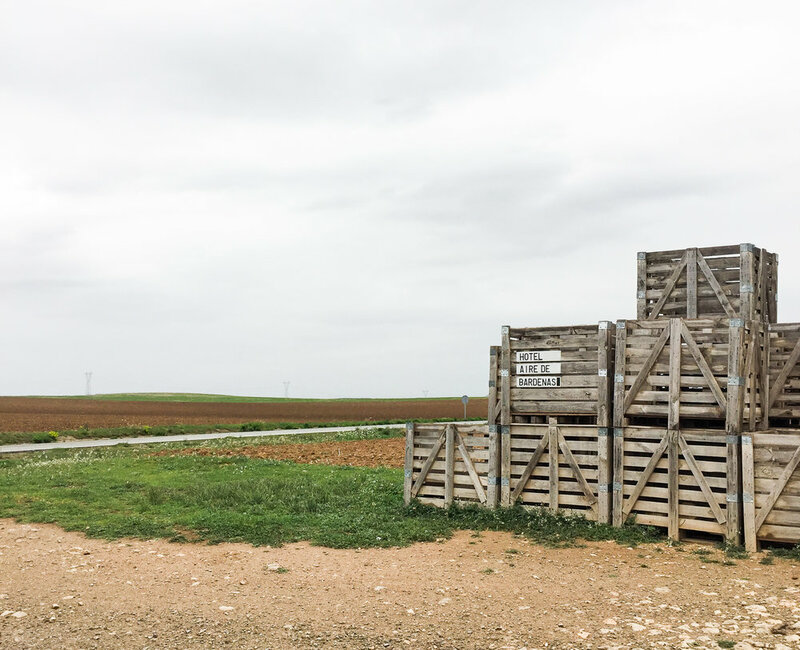 When you pull up, in that desert-like setting so strangely plopped in the middle of green Basque Country, a pile of pallets is all that announces its presence. Pallets mark the grounds of the hotel, the parking, the main building, and the stand-alone rooms. The main building holds the “normal” rooms, which are anything but. These cube-like structures have gigantic window seats that look out onto private gardens or the surrounding fields, luxurious bathtubs (my room also had a metal bathtub in the garden, which we filled with steaming hot water and jumped into in the dead of winter), and very comfy beds. Outside of the main building is an area separated by wooden pallets, a recurring structural element that lends the hotel an eco-chic air. This is where the bubbles live. These lunar landing pads have been converted by the geniuses at Aire de Bardenas into comfy “rooms” that are open to the stars. By day, you have amazing views over the dusty wheat fields surrounding the hotel. By night, it’s just you and the stars. These rooms are in demand, so be sure to book them ahead of time. This innovation and creativity has garnered the hotel twenty six architectural and design prizes over the years. As a guest in the hotel, though, that just translates to a sense of wonder and excitement. Every detail is carefully thought out to be, basically, the coolest thing you’ve ever seen. Instamatic cameras are available for your use, to document in the hippest possible way your stay. Breakfast is served by waiters, an its an array of fresh fruit, preserves, delicious ham, fresh squeezed orange juice, and more. For those who don’t want to leave the grounds, the restaurant is recommendable, with a tasting menu based on local Navarran products (think, best vegetables ever, some of them from the on-site garden) with a Mediterranean twist. There are hotels that give you somewhere to lay your head in between sightseeing, and then there are hotels like Aire de Bardenas, hotels that are worth the drive and demand your attention and awe.